The award winning Show- & Marching band on your event, anywhere around the world! Welcome to the internet site of the Christian music club Kunst en Genoegen, better known as K&G. Founded as a harmonica club on October 1st 1928 and blossomed into a leading music band containing of 3 orchestra’s: the Show- & Marchingband K&G, Young K&G and K&G 3. K&G has over 200 members, subdivided in Superkids, pupils, junior-, senior-, K&G 3, committee- and non-playing members. Beside these, K&G has a large group of volunteers, who take part in several commissions, such as the canteen-, maintenance-, material- and event-commission, the PR-team and the service team. On this site you will find all information of this great club! On behalf of the committee and the members we wish you lots of pleasure visiting our site. The Show- & Marchingband K&G, jewel in the crown of the K&G music club, was founded in 1928 as a mouth organ club. In the following years the club was transformed into a drum, piper and trumpet corps and, since the early seventies of the last century, has expanded to a band with drums, percussion, piccolos, flutes, saxophones, trumpets, trombones, euphoniums and sousaphones. During performances the band is led by drum major Kevin van Egmond. The repertoire of the band consists of a number of well known marches from English, Eastern European, American and Dutch origin for street parades. The show, that is currently performed by the band at tattoos, is based on British Popsongs. The band also plays choral music and concert works. The band has recorded many LP’s en CD’s. The Show- & Marchingband K&G has since 1962 competed eleven times in the World Music Contest (WMC) in Kerkrade, the Netherlands. 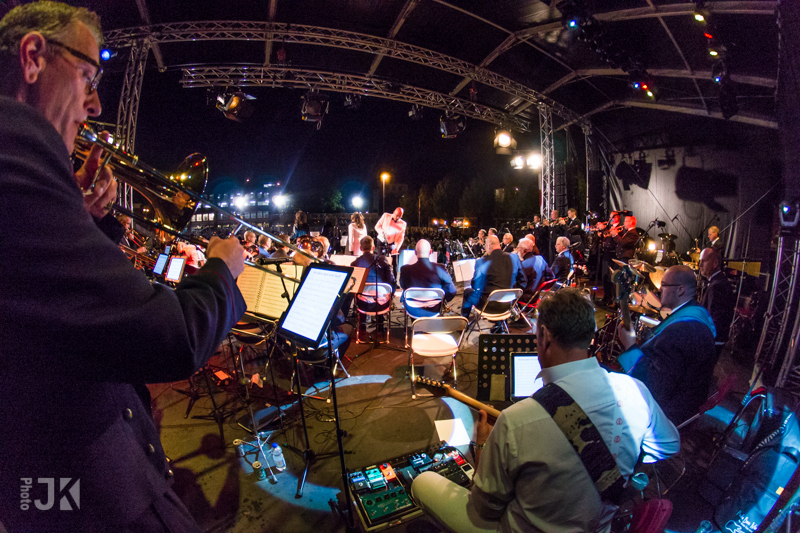 The WMC is a four yearly event bringing together tens of bands and orchestras from all over the world to contend for the championship in their class of performance. Since its first participation in 1962 the band has attained several outstanding results in this internationally highly rated competition, culminating in winning the overall championship in both the marching and show competitions during three editions of the WMC. Winning three times the ‘double’ in a row is up till now an unprecedented event in the history of the World Music Contest. Of course, the show cases in the band’s club house are richly filled with all medals, being won, and other evidence of appraisal awarded to the band. The latest distinction bestowed on the band was being awarded the Sudler Shield by the John Philip Sousa Foundation in the USA. The Show- & Marchingband K&G is the first European band that has been honored this way by the Foundation for its outstanding musical and show performance. The uniform of the members of the band is derived form the uniform of the United States Marine Corps. The perfection in drill and music playing is well appreciated by the public, as is the specific sound of the band. So, understandably, the Show- & Marchingband is very often invited back at several occasions. The youth band of the K&G music club, called Jong K&G, was founded on April 1,1954. Far from being April’s fool, the band has worked itself up to the status of a well known, illustrious band in the Netherlands as well as abroad. The instruments of the band are drums, percussion, piccolos, flutes, trumpets, trombones, saxophones, euphoniums and sousaphones. The members, ranging in age from 9 through 16 years, rehearse twice a week under the direction of an experienced instruction team. During performances the band is led by drum major Diego Verhaar. 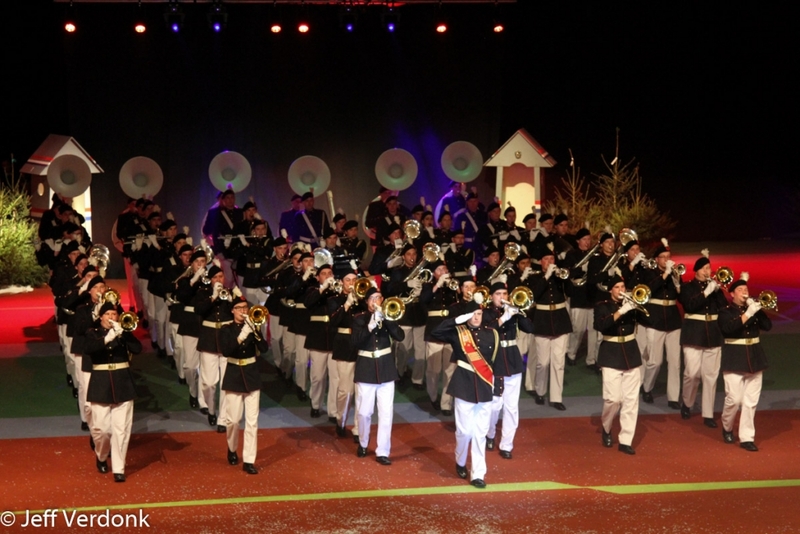 The youth band Jong K&G has competed four times in the World Music Contest (WMC) in Kerkrade, the Netherlands. In 2001 Jong K&G attained the highest international ranking in the marching contest, leaving behind many ordinary, non youth bands. Jong K&G visited the English city of Oxford four times and gave a concert in the Royal Military School of Music, Kneller Hall, in 1994. The stage band K&G 3 has found itself a firm place between the other bands of K&G. The band was founded on August 1, 1994 as a successor of the in October 1983 en on June 6, 1993 terminated ‘Stage band”. Another setting of instruments and choice of repertoire has made K&G 3 a full grown member of the K&G family. The band is invited to perform several times each year. The 37 members of the band rehearse each Monday night conducted by their instructor René Leckie. The repertoire consists of songs and music from musicals and movies, pop music, latin- and dance music. But ballads and classical music are also included in the repertoire. The instruments are trumpets, trombones, euphoniums, flutes, saxophones, sousaphone, string bass and percussion. Like the Show- & Marchingband and Jong K&G the stage band K&G 3 also had the honor to play for Queen Beatrix during her visit to Leyden on occasion of the celebration of her birthday. Most of the concerts are being given on invitation in the Netherlands, but the band has performed in Germany and England as well. The band is each year invited to play a role in the famous October festivities commemorating the liberation of Leyden from the Spanish troops in 1574. The number of concerts varies between 10 to 15 per year. To prove the close bond between the music club K&G and its musicians, the stage band counts two honorary members (Ben Horsman and Rinus Fontein) who are more than 50 years member of one of the bands of the club.